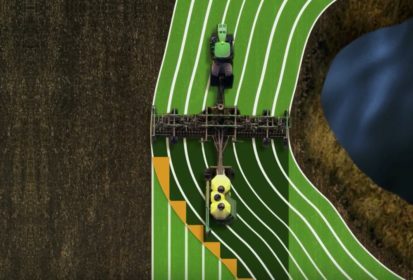 Engage Zone Control from Intelligent Agricultural Solutions is the industry’s first retrofit section control available for John Deere 1910 air carts. Easily installed underneath the meter housing, Engage Zone Control integrates with the existing GPS mapping system to spot areas of potential overlap, and uses electric motors to actuate slide gates that shut off up to eight sections per tank (up to three tanks per cart). Air seeders saw section control technology on new machines around 2014, but retrofits to existing carts were not readily available. Engage Zone Control will be available in 2018. Click here to watch a YouTube video showing how Engage Zone Control works.